Handle all your cooking jobs with one powerful appliance – no fat, no oil, and now with a versatile rotary function! 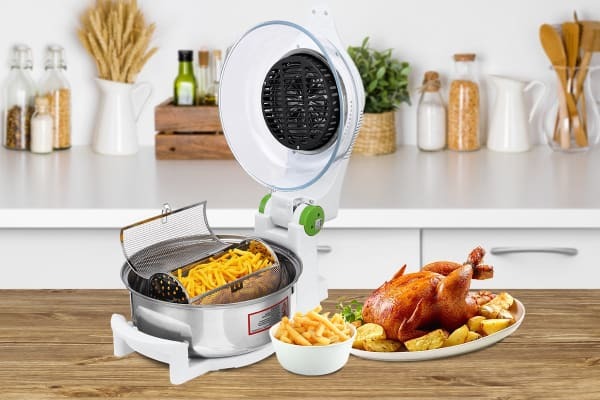 The Kogan 12L Rotary Air Fryer can fry crispy, golden chips in under 20 minutes – fat and oil free! Enjoy the same look, same crunch and same delicious taste, without the guilt. Cooking with the Air Fryer is the easiest way to reduce your daily calorie count. Now, you can serve up healthy family meals that aren’t dripping with oil. It’s perfect for anyone trying to lose weight and maintain a healthy lifestyle, while still enjoying the foods you love. A rotisserie in your own kitchen! Imagine being able to cook a succulent rotisserie chicken in your very own kitchen? Take your Sunday night roast to a whole new level thanks to the air fryer’s awesome rotisserie function. It slowly rotates food, allowing for truly even cooking and regular basting for maximised flavour. Using the included rotisserie attachments, you can cook marinated roast beef, crusted leg of lamb, Greek-style meats and so much more! It’s the Air Fryer’s versatility and multitude of functions that really sets it apart from other cooking appliances. It fries, roasts, bakes, BBQs, grills, broils and more, making it extremely cost-effective and space-saving. Cook crispy tempura prawns, succulent roast feasts, sweet potato chips or even a decadent chocolate cake with the one handy appliance. All of course, with little to no oil. Fry – using turbo air and food rotation you can fry foods from all angles, resulting in evenly cooked meals that are low in fat and oil. Roast – cook a roast chicken in under 30 minutes! 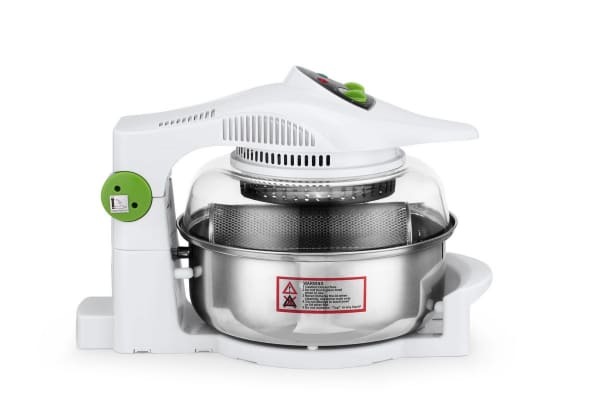 Bake – circulating hot air allows you to bake the fluffiest cakes, as well as sweet treats like creme brulee and apple pie. Grill – sear meats quickly at high temperatures for tender and juicy skewers and drumsticks, or even homemade pizzas. Defrost – forgot to remove your meal from the freezer? Don’t stress, just use the convenient defrost function. Steam – the perfect function for evenly cooked veggies every time. It’s easier than normal frying, too! If you get home from work late and don’t have much time to prepare meals, the Air Fryer is the perfect appliance for you. There’s no need to stand by your frying pan, tongs in hand. Simply place whatever you’re cooking in the Air Fryer, crank up the heat and away you go. 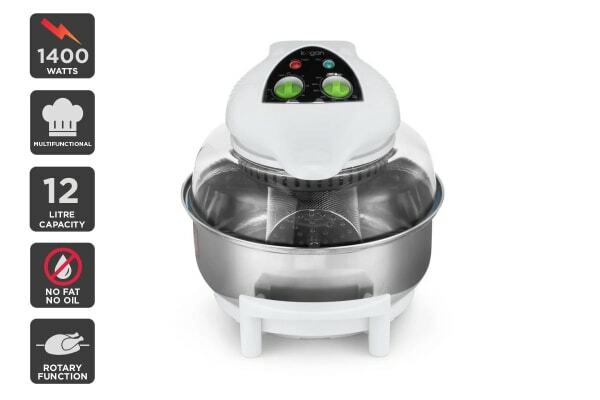 Air Fryers heat up quickly and are known for being able to cook foods faster than conventional methods. Through hot air circulation, the Air Fryer cooks your foods from every angle with even heat distribution, sealing in the juices for maximum flavour. Plus, since there’s less oil and grease being used, clean up time is quicker too! 1400W power for tougher tasks.